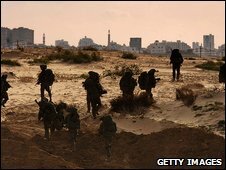 Israeli troops have entered the suburbs of Gaza City and are engaged in street fighting with militants, reports say. Witnesses said Israeli special forces had advanced several hundred metres into several neighbourhoods and that intense gunfire could be heard. Earlier, Israeli planes attacked more targets in Gaza as Israel’s offensive against Hamas entered an 18th day. A UN watchdog meanwhile accused Israel of showing a “manifest disrespect” for the protection of children in Gaza. The UN Committee on the Rights of the Child said more than 40% of those killed in Gaza were women or children, even though the Israeli government had signed a UN protocol condemning attacks on places where children were likely to be present. The attacks would have a severe emotional and psychological effect on an entire generation of children in Gaza, it added. A Palestinian human rights group earlier said more than 90,000 people had fled their homes during the conflict. Palestinian medical officials say more than 40 people were killed on Tuesday, and that the emergency services have been unable to reach many of the areas targeted by the Israeli military. They say that since the offensive began on 27 December, 971 people have been killed in Gaza – of whom 311 were children and 76 were women – and more than 4,400 people have been injured. Thirteen Israelis have died, three of them civilians, Israel says. 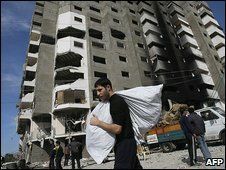 Despite the Israeli offensive, militants in Gaza have kept up rocket attacks on southern Israel. The Israeli army said on Tuesday that 25 mortars and rockets had been fired out of Gaza and that Israeli war planes had carried out more than 50 air strikes since the morning. Israel says it will not call off its offensive until it has stopped the rocket attacks and prevented arms being smuggled into Gaza. Talat Jad, a resident of the Gaza City suburb of Tal al-Hawa, said he and 15 members of his family had gathered in one room of their house, too frightened to look out of the window. “We even silenced our mobile phones because we were afraid the soldiers in the tanks could hear them,” he said. Analysts say Israel may be holding back from all-out urban warfare in Gaza City. Intense street fighting could complicate truce efforts and cause heavy casualties on both sides, which they say would be a politically risky move less than a month before Israel’s parliamentary election. Diplomatic efforts to achieve a ceasefire are continuing in Cairo, where Egyptian mediators are pressing Hamas – which controls the Gaza Strip – to accept a truce proposal. Egyptian President Hosni Mubarak also made an unannounced visit on Tuesday to Saudi Arabia, where he discussed the situation with King Abdullah. The BBC’s Magdi Abdelhadi in Cairo says the meeting indicates that Egypt is seeking Saudi Arabia’s help in persuading Hamas to accept a ceasefire. Earlier, Hamas spokesman Sami Abu Zuhri said any agreement would have to entail a halt to Israeli attacks, a complete withdrawal of Israeli forces and the opening of border crossings to end the blockade of Gaza. However, the Israeli foreign ministry said there was no guarantee that Hamas would respect any ceasefire agreement. Earlier, the head of the International Committee of the Red Cross (ICRC), Jakob Kellenberger, visited Gaza to see the humanitarian situation for himself. Speaking on a tour of Gaza’s main hospital, Mr Kellenberger said he had been saddened by what he had witnessed. “I wanted to see this hospital and I can only say this is really very sad and it hurts a lot when you see what I’ve just seen,” he said. Israeli Defence Minister Ehud Barak said the military operation would continue in order to stop Hamas rockets being fired into Israel and to prevent arms smuggling into Gaza. “We are working towards those two goals while at the same time keeping an eye on the diplomatic initiatives,” he said during a tour of an Israeli air force base. Meanwhile, Palestinian Authority President Mahmoud Abbas accused Israel of trying to “wipe out” his people. “This is the 18th day of the Israeli aggression against our people, which has become more ferocious each day as the number of victims rises,” he said. US Secretary of State-designate Hillary Clinton said in her Senate confirmation hearing on Tuesday that the Obama administration would make “every effort” to forge Israeli-Palestinian peace. “The president-elect and I understand and are deeply sympathetic to Israel’s desire to defend itself under the current conditions, and to be free of shelling by Hamas rockets,” she said. The Al-Mizan Centre for Human Rights, a Palestinian group, said that more than 90,000 people had abandoned their homes to escape the Israeli bombardment.